First, and foremost, a Ranch-style modular home only has one story. Apart from that, most plans include these types of elements. This style of homes averages about 1500-1700 square feet of living space but can be as large as 2500 square feet. 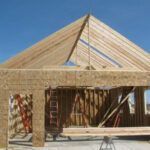 Generally speaking, the cost of building a two-story home is less than a ranch-style modular home. This is because you don’t have the cost of the more expensive items, such as the foundation, for that second story. However, you will find that you save money in other ways. First, there are no staircases to take away living space. A single staircase can cost you 100 square feet from both floors. Because of their horizontal layout, it’s relatively easy to add an addition to a ranch-style modular home. You just marry another module to the end of the home. Plus, if you should desire to build a second story, the ranch’s design makes it possible (although not always practical – check with your builder first) to go up instead of out. Ranch-style houses embrace a less-formal lifestyle than other types of housing, so the floor plans tend to be more open and free-flowing. For those with mobility issues, this type of layout is perfect. Without dividers or stairs, many find they can stay in their homes longer and more comfortably. To give you an idea of what it will cost to build a ranch-style modular home, let’s consider the 1600 square foot Crowne 113 Ranch. In addition to the cost of the land, the home itself will run about $100,000 to build and set on the property. Apart from that, you will need to allow additional money for options such as a garage, driveway, and patio. A simple 22X22 attached garage, including the garage door and opener, siding/roofing, and concrete work will add to your modular home cost between $15,000 and $17,000. A garage is optional, but not only does it add to the value of your home, but it’s also a predominate design feature for ranch-style homes. Concrete work generally runs between $4-$6 per square foot. Other costs might include hooking up water or drilling a well, or even running electrical power to your land. Each situation is different. 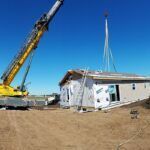 The best way to know for sure what the cost of your ranch-style modular home will be is to call for a detailed estimate. At Next Modular, we know that building a home is likely one of the most important financial decisions you will make. As an experienced modular home builder, we are committed to being your guiding light through this process. If you need a modular home built near Goshen IN, call Joel Comino at Next Modular (574) 202-5161.